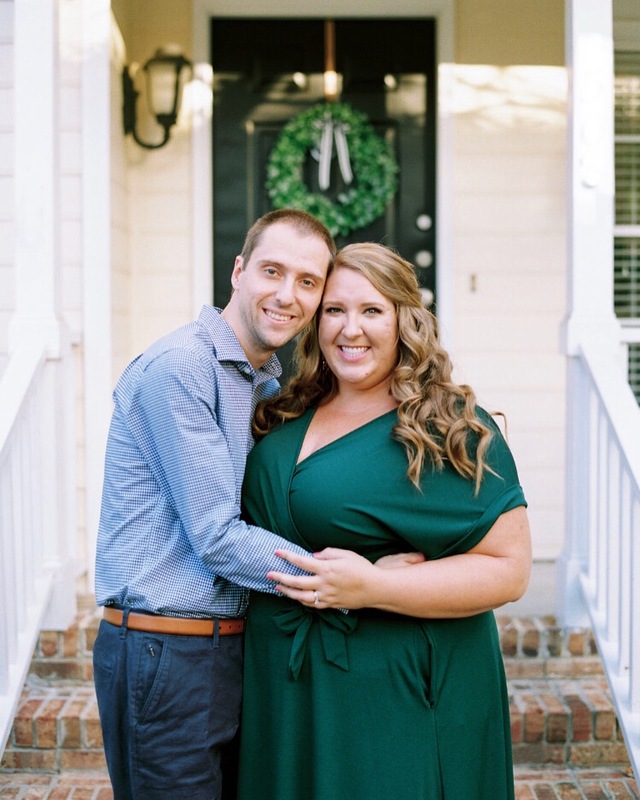 I am so delighted to introduce to you today’s bride spotlight, Sarah Holbrooks! Sarah and Jay are getting married at The Merrimon Wynne House in downtown Raleigh later in March, and it’s a day we’ve been eagerly anticipating for well over a year! Their engagement photos by Anagram Photo are absolutely beautiful, and I am thrilled to share some of these stunning shots with you today. Sarah and Jay are one of those couples that you dream of working with, and this last year has been truly so magical working with them to plan a memorable, meaningful, fun, and heartfelt wedding day. Sarah is wildly compassionate, generous, wise, hilarious, and kind, and I have been so blessed to get to know her so well and celebrate alongside them. There’s really not a day that goes by that Sarah doesn’t email or text to tell me something encouraging or to thank me profusely, and I couldn’t be more appreciative or grateful to not only be planning their wedding – but to know these two. I say it all the time, but it’s so very, very true: I am incredibly blessed to work alongside and serve the most amazing, loving, generous couples who have such beautiful and inspiring love stories. Sarah and Jay are so much fun to be around, and you can tell just how much they love one another. I am so excited about all of the personalized, special touches we’ve designed and brought into their wedding design, and the little details really showcase their personalities and celebrate their family, friends, and community so well. We also have the most phenomenal team of vendors coming together for their wedding, and I am thrilled to be working with such passion and talent in just a couple weeks. And Sarah’s bridal session is today, which makes their wedding feel oh so close!! She is such a stunning bride, inside and out, and I cannot wait for Sarah and Jay to get married. 1. Tell us a little bit about you and your fiancé, Jay! Jay and I met at the end of 2013 – two of our best friends (both in the wedding party) introduced us by inviting us over for dinner. We hit it off right away and have been inseparable ever since. We enjoy spending time together- long walks, creating art, spontaneous trips to our favorite restaurants, spending time with our families, traveling to new places and of course, spoiling our three year old cat, Zeus (who made his way to the wedding invitation suite, by the way!) . We also have serious Raleigh pride and love living downtown. Saying yes to spending forever with my person! And being surrounded by all of our family and friends. Stephanie helped me a lot with this. I wanted a natural palette with dusty blues, neutrals and lots of greenery. Stephanie has truly brought this to life, and I cannot wait to see it all come together on our big day. This was a hard decision to make, but we are doing a first look. We are both excited to have that moment alone (with our photographers, of course) before things get busy. I am really looking forward to that special moment together. I know I will be fighting back tears! Jay and I love going on long walks around our neighborhood downtown. Some of our best conversations have come from these long strolls. Of course, sometimes we will stop for a glass of wine and apps at our favorite Raleigh spots! Caring for others. I really do enjoy my work as a nurse practitioner and the time spent in ICU nursing which led me to where I am now. I am honored to have the opportunity to educate patients about their conditions and things they can do to improve their overall health all while building long-term, trusting relationships. How many decisions there are to be made! I have been a bridesmaid numerous times, but never knew exactly how much detail goes into wedding planning. However, I have been blown away by how much Stephanie has helped me and walked me through the whole process. I knew she would be helpful, but not to this degree. It’s wonderful to work with someone who is so passionate about what she does. She has been the best investment in this wedding thus far! Can I say all of it? From the flowers, to the bridesmaid dresses to adding some of our own artistic elements into the reception – I think it will all fit nicely and align with our vision and personalities. Can’t say I’m not excited for the flower crowns, too! 10. What is your favorite thing about Jay? Just one thing? This is difficult. I think it would have to be that every time I think he couldn’t impress me more, he just does. On a daily basis. He is the most unique, caring, respectful and truly special human I have met. He is all of the things I could ever want in a life partner. Thank you, Sarah, for giving us a sneak peak into your upcoming wedding! We are all so excited for their rapidly-approaching big day and wish this beautiful couple a lifetime of love, laughter, and joy! Congratulations Sarah and Jay!! Great photos – beautiful couple!